Peckham is officially trendy, and the pace of new restaurant openings has increased accordingly. The area retains much of its buzz and charm (for now at least) with Rye Lane and the High Street a jumble of African food shops and independent openings. Tucked behind is the well-to-do Bellenden Road area, with its leaf-lined streets, and delectable delis. Here's how best to enjoy the mixture of Peckham's old and new. The trendy but twee Pedler is actually open all day and evening but gets particularly full for brunch from Friday-Sunday, when locals pile in for the breakfast burrito with 'angry' scrambled eggs (they're spicy). Breakfast kicks off at 8am for Anderson and Co., a bright, modern café serving eggs, porridge, French toast granola and the like — we love to sit in the garden when the weather warms up. Petitou remains a popular and pretty spot in the Bellenden area, famous for its no-nonsense breakfasts and large plates of fluffy scrambled eggs. There's a shaded outside seating area which is great for summer and makes up for the slightly uninspiring food. Peckham Refreshment Rooms opens its doors at 8am, serving glorious, golden Burford Brown eggs with streaky bacon and bowls of prunes steeped in Earl Grey tea. From one station to another — there's a branch of Blackbird Bakery to be found near Queen's Road Peckham with the usual coffee and cakes. If you fancy a full English with a twist then check out (the pricey) No. 67 for the full Spanglish (with chorizo and morcilla) or a full veggie (with halloumi). Finally, if you can't move at all due to a hangover on Saturday or Sunday, then The Breakfast Co. will deliver everything from a full English to stacks of fresh pancakes to your home. We love Peckham's famous yellow corner shop, Persepolis, which now has a fantastic little café in the back. Owner Sally cooks Iranian delights and serves them in her own faintly chaotic, charming style. 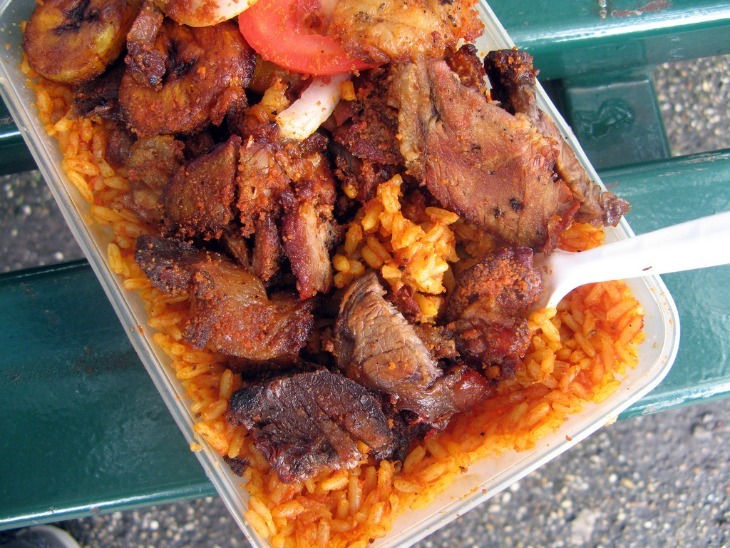 Over the road you’ll find Nigerian BBQ at Obalende Suya Express — skewered meat is rubbed with ground peanuts and spices, cooked over coals and served with jollof rice and plantain. Jerk chicken awaits you at JB's Soul Food near the library. We recommend the large jerk chicken meal with rice and peas, slicked with their sweet n spicy sauce. Just follow the fragrant smoke coming from the grill. Do ya like suya? Photo: Helen Graves. Head up Rye Lane to the no-nonsense Asian Takeaway (yes, it really is called that). This small hatch contains a tandoor where they cook fresh naan and kebabs, plus there's a range of curries available, typically with mutton, spinach and lentils. There's no seating (other than a couple of chairs outside) and it's best to hang around while they prep your order to ensure speedy service. If it's a burger you’re after then a branch of Honest Burgers is open on Blenheim Grove (their American-style Tribute burger is fantastic). Tucked away off the main road is Yada's Kurdish restaurant, a charming, ramshackle space serving Kurdish delicacies, such as kubba (crispy, meat filled rice cases), kebabs and pickles. 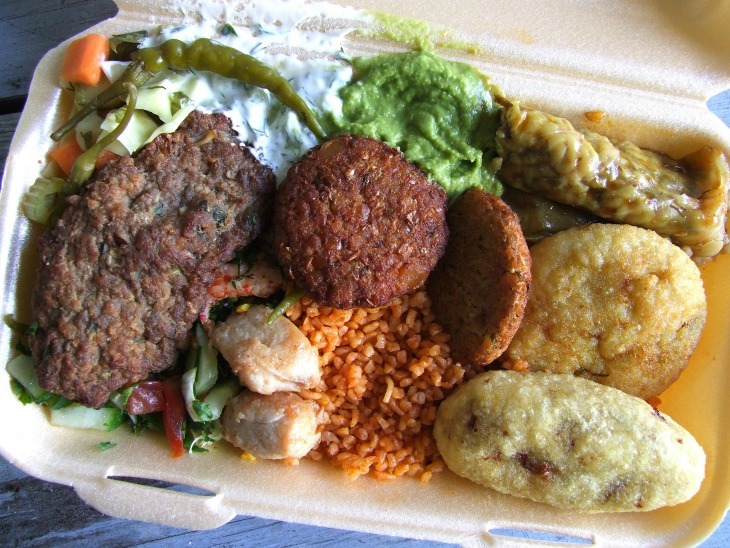 There's more Kurdish food, courtesy of Nandine, in Peckham Levels. Takeaway from Yada's Kurdish Restaurant. Photo: Helen Graves. Vietnamese restaurant Banh Banh servies bánh mi, summer rolls and a wider selection of Vietnamese dishes. Finally, don't forget there's a branch of Manze's, for all your traditional pie, mash and liquor needs. To be honest, you could eat anytime at Peckham Levels — a hip food court (and much more) located in the same car park as famous campari haunt, Frank's. A cocktail bar, wine bar and beer bar mean all alcoholic thirsts are catered for. Rye Lane is a treasure trove of Nigerian snackage, if only you know where to look. 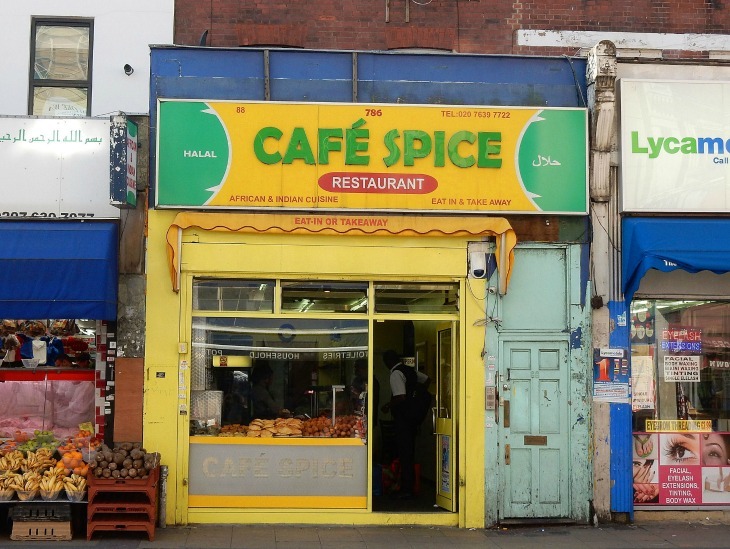 Café Spice is famous for serving all the classics such as moin moin (steamed bean pudding), puff puff (like Nigerian doughnuts), meat stick (does what it says on the tin — very spicy) and other larger dishes. Cafe Spice serves Nigerian classics. Photo: Kake on Flickr. Rosie’s café is perfect for a light bite with its large, colourful salads and hearty soups. See also: cafes in the 'breakfast' section above. Melange chocolate shop and cafe has recently moved to Maxted Road, so head there for a hot chocolate on chilly days. Mr. Bao serves Taiwanese hirata steamed buns, soft, fluffy sandwiches with various fillings including pork belly, prawns and a sweet s'mores bun filled with marshmallow. They also serve a brunch of bacon, eggs and the like, with a steamed bun on the side. 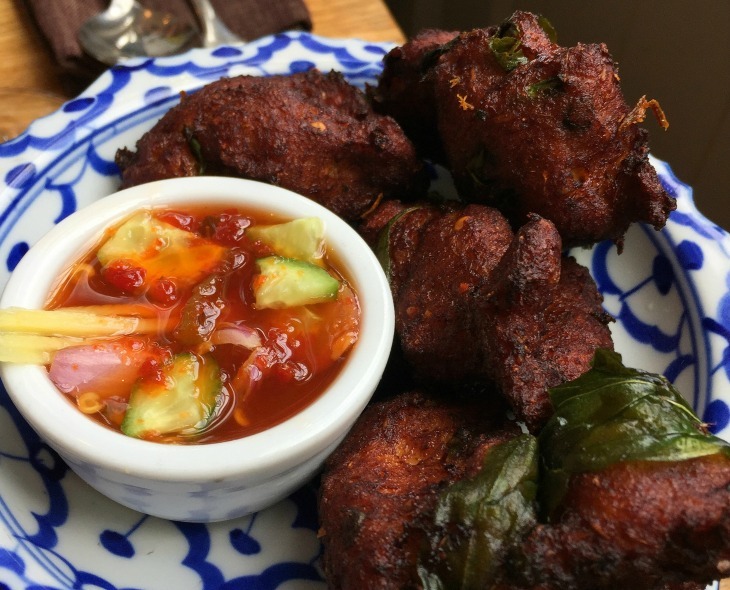 In the leafy Bellenden area you'll find The Begging Bowl, a solid Thai restaurant that has nurtured more than one talented chef through its kitchens. We've got a large soft spot for the bouncy fish cakes, pictured below. Bouncy, bouncy fish cakes at The Begging Bowl. Photo: Helen Graves. Over the road is local Italian Artusi, with its emphasis on fresh pasta and quality ingredient sourcing — a modern contrast to the much loved but more homely style of Il Giardino down by the station — a charming, family-run spot which locals adore because it's a little like sitting in someone's living room. Steaming bowls of pasta can also be found down the road at Forza Win. 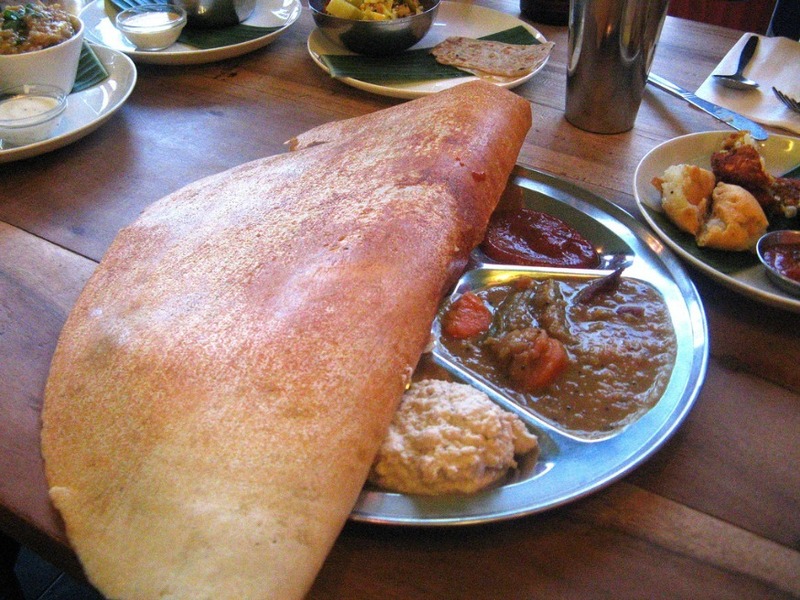 A dosa at Ganapati south Indian restaurant. Photo: Helen Graves. For more spice, head to south Indian restaurant Ganapati, one of the first restaurants in the area to get attention and still going strong (they also deliver). Up the road is Peckham Bazaar, a lively restaurant serving pan-Balkan cuisine, much of it cooked over charcoal. Don't miss the octopus if it's on the menu. 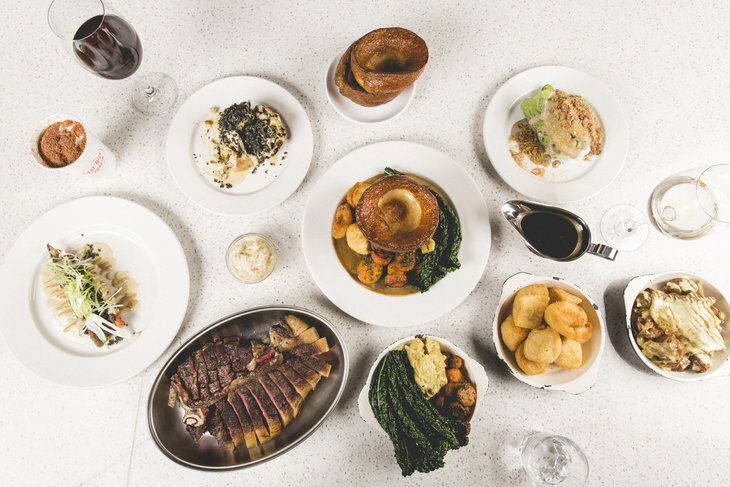 Coal Rooms — nestled inside Peckham Rye station — serves up ballsy, smoky meat which will knock your palate for six. Aside, hidden down a residential road behind Peckham Library — serves a stonking roast dinner too. The Montpellier — or The Monty as it's known locally — has now expanded its beer range and there's even a cinema at the back. Gets very busy on weekends but you know, it's a pub. Near the station, Bar Story is ever popular although looking scruffy nowadays; it's popular with students. The happy hour cocktails are the best (and strongest) in London. Frank’s needs no introduction by now, opening every summer on top of Peckham's multi-storey car park. We’re big fans of the bar at Brick Brewery on Blenheim Grove, which serves a range of their own beers brewed on site (go for the Berliner Weisse). Juicy burgers and the like are provided by Slow Richies. The Nines serve Brick Brewery's beers alongside cocktails in a space which makes up in atmosphere what it lacks in soft furnishings. Just up the road is the legendary Canavan's pool hall, perfect for those times when you just need to get a late night pint and shoot some pool. 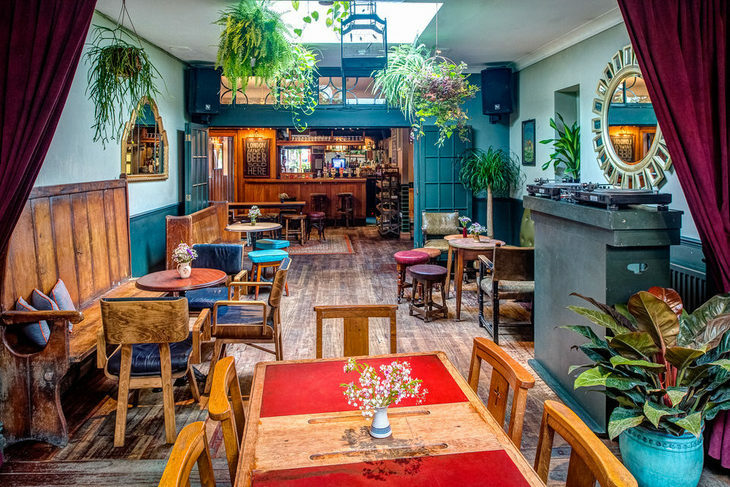 The Hope is proving popular, packed with drinkers supping craft beers and hoovering toasted sandwiches, while The White Horse has been serving Peckham since the 1800s and is now run by the same people who run The Montpellier. It serves real ales, London brewed craft beers and cider (the roasts are decent too). Elsewhere on Rye Lane, John the Unicorn (like The Hope, an Antic pub) serves a range of real ales and beers. The kitchen is headed up by Ben Mulock, formerly of The Opera Tavern. Finally, there's The Four Quarters, an 'arcade bar' full of video games, which we don't mind admitting make us feel old. The craft beer selection here is one of the best in Peckham. If you're headed Queen's Road way, then it has to be the pint-sized Beer Rebellion.